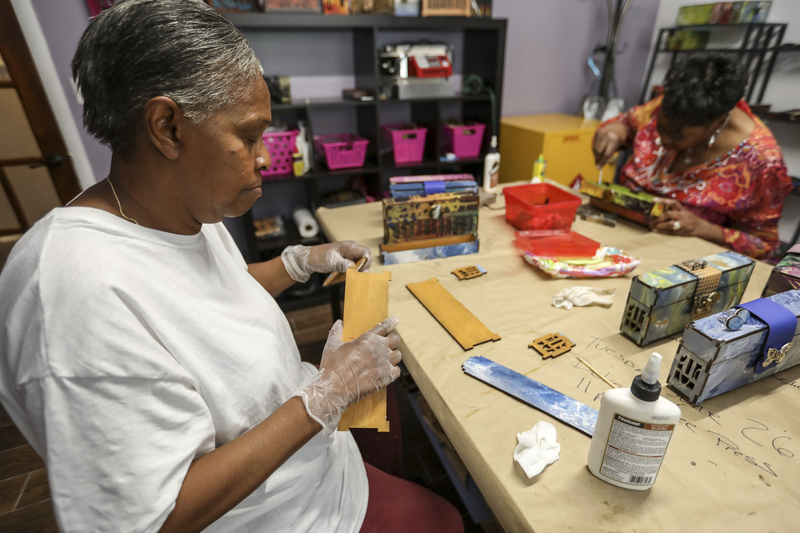 DETROIT — In a small room full of decorative handbags and clutches, Tonya Carswell is seated at a table as she meticulously constructs a handbag. All the while, she talks about life after her release from prison. Carswell was riding in a car in 1974 when the woman driving pulled up next to a man named Karl Bestmann. Carswell shot and killed Bestmann and stole his wallet. Carswell was just 22 years old. She had just voted for Coleman A. Young, Detroit’s first black mayor. And suddenly, she was headed to the Detroit House of Corrections. Carswell was referring to the work she does with Bags to Butterflies, a transitional employment program in Detroit where formerly incarcerated women design handbags for sale and are offered mentorship. The program aims to help women re-acclimate to their communities after being in prison. Carswell, who has been in the program for almost a month, was released in April from the Women’s Huron Correctional Facility, Michigan’s only prison for women. With the help of Bags to Butterflies, Carswell is going through the process of getting a driver’s license. She also hopes to find a home for her 90-year-old aunt, who currently lives in a senior living facility. However, Carswell said that because she hasn’t used technology (like a cellphone), it’s often difficult to find her way around. “It’s challenging, I’ll tell you,” Carswell said of her life after release. “I’ve had some difficult times, and I’ve been lost about five or six times. This isn’t the first time that Carswell has attempted to restart her life. In 1976, she escaped prison for 11 months and was pregnant when she was caught and sent back. She gave birth to a son while in prison. “I have good friends that help me, and a good boss,” Carswell said, referring to Michelle Smart, founder of Bags of Butterflies, who sits across the work table. Smart shed tears as Carswell talks about how the program has helped her. “My best friend’s daughter made a split-second decision, and she is now incarcerated,” Smart said.